Discussion in 'Cross Country, All Mountain & Trail Riding' started by ZenkiGarage, Mar 4, 2008. I race bmx and was looking for a bare bones SS trail bike to mob my local trails on. Saw this little number on sale so i picked her up. Added a short hussefelt stem, and 50mm rise suneline bars. Took it for a quick spin and I LOVE IT! Im definatly hooked on 29ers. Oh and the bike is last years model redline monocog. Now quick question: Is this a decent frame? I got it cheap that why i bought it but now that i like it im thinking of adding disks and shaving the v-brake bosses and possibly adding a maverick sc32 fork. Just dont wanna spend the cash if this frame is garbage. I'd say for the first "upgrade" go to discs - but give rigid a try for a while before going for a Maverick fork. That puts you in for the fork, plus a new front wheel (which would end up being as much - if not more than you probably paid for the complete bike). Yeah i figured with whatever fork i get, its going to cost more than the whole bike did since i only paid $300 for it. My biggest concern is frame strength since this is an entry level machine. Frame is reported to be very strong, and lots of people say it is one of the sweetest handling 29ers around. If you don't mind the weight, go for it! Well worthy of upgrades. Enjoy the bike, 29ers kick it. The frame is strong - so don't worry about that. Keep an eye on the headset though - they spec'd em pretty cheaply and I don't think the head tubes were faced either - just be mindful of it. Ride the snot out of it and enjoy the smiles it brings! Looks like you got a good deal on a nice bike. I come from a BMX background as well and have been very happy with the Monocog I bought. It is a lot of fun to ride. Mine feels like a very big BMX. The only thing that took a bit of getting used to was the mellow steering. 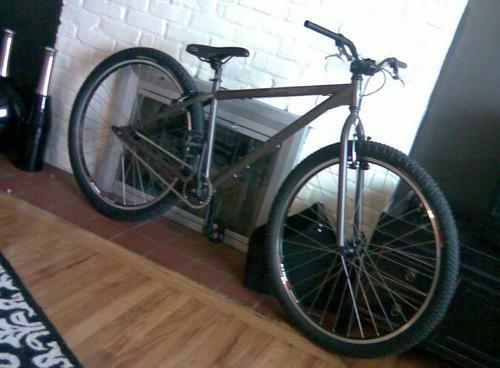 yeah i'm a bmx'er and just got a kona unit 2-9'er. its a super fun ride. i've been riding it about 3 weeks on some fairly rough trails(roots and rocks) and i'm definitely upgrading to a suspension fork. i guess i'm just too used to smooth riding, haha. yeah its been right at a month now, rigid is pretty fun but its killing my hands/wrist/arm combo. ordering a fork in a week or so when a client pays up. I'm a BMXer too, I am currently building a new ss. I was thinking about a 29er, but I want something I can manual. How do they handle? Are they hard to hop? its really hard getting used to manualing my 29er. i can do rollers and stuff like that, but i can manual as long as i want to on my 20, so its def a different beast. as far as hopping it, its def not as easy. i can hope handlebar high on my 20, but only about 2 feet on the 29er. its just harder to get that front wheel up without getting waaay back on it. but hoping curbs and trees over the trail aren't bad at all.